My simplistic SW-project for automating the tedious task to center on a target is slowly bearing fruit. At last I have a GUI written that can be used to test whether my library works correctly or not. The current capabilities of the GUI are capturing an image (at least screenshot, ASCOM and from file works), solving it with astrometry.net -solver, syncing and reslewing an ASCOM compatible telescope, and calculating the distance from assumed target and solved image center. 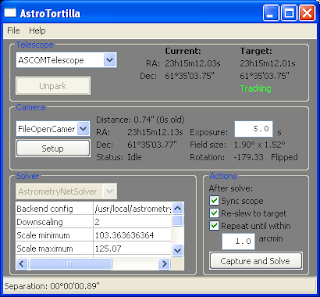 I'm still not decided on the name, currently the library is AstroMate and the preliminary name of the GUI is AstroTortilla. Hopefully I end up with a single name, although the second utility based on the same library is an alignment helper (currently unstarted and unnamed) based on automatic imaging and solving when moving on the RA axis.